Volunteer Cosmetology recently participated in the SkillsUSA Regional Contest held at Northeast State. 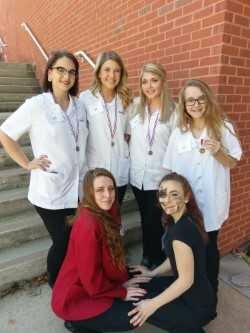 Ireland Aistrop placed 2nd in Esthetics with Emily Grace Christian as her model. Ireland's contest consisted of Makeup application and Fantasy Makeup. Macy Perry placed 2nd in Cosmetology. Macy's contest consisted of a Woman's Designer haircut and an Evening Style. Delana Simmons placed 4th in Nail Care with Averee Miles as her model. Delana's contest consisted of Acrylic Nails, Gel Nails and Nail Art. They will all compete at SkillUSA State Contest held in Chattanooga in March. Lilly Kincer placed 3rd in Demo Evening Style. The contest is open to all SkillsUSA members in all Regional high schools. The picture from left to right front row Averee Miles, Emily Grace Christian. Back row Ireland Aistrop, Lilly Kincer, Macy Perry and Delana Simmons.